At the beginning of 2015, I started Shop.Share.Tag.WIN!. The instructions for that campaign was shipped with all orders. Instructing Smell Gooders to snap a picture of their order, and post it on social media tagging us. 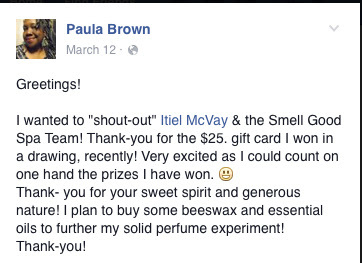 Monthly winners received their choice of a Signature Fragrance Oil or Signature Hand-Dipped Incense. I went back to my business mission: Our mission is to produce fine, quality products; encourage women consumers to seek healthier options in bath and body care and aromatic home products; be a positive tool in the community through empowerment and philanthropy. Right then, it was decided to send a $25 Visa Gift Card to one of the participants. The gift card wasn't subterfuge, but the altruistic duty to be good to those who are good to my business. The majority of the people within my community can use a bit of positive help to fill their needs. At the end of 2015, the drawing took place. I was so excited with the knowing that someone would have a little extra. It happened to be Paula! Packing up items to give away, at the young age of 8, I said, "Well, I don't want this anymore, so I'll give it away." 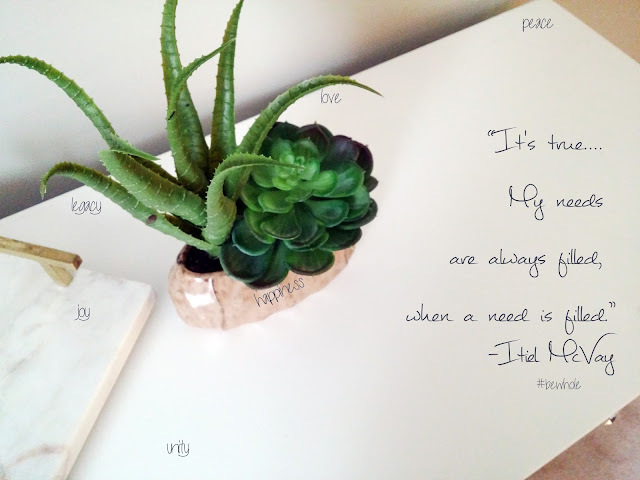 My grandmother quickly expressed and planted a seed in me that took root... Well you should keep it, because when giving to others, you should not do it because you no longer want it. There are daysssssss when business is sloooooooooooooooooow. When I sit with my soul, I ask if I've done everything that I could do within my power. The answer is either yes or no. In either response, I sit, wait, praise, and express gratitude - - the solution is there; a way is being made. It never fails, a call or an email comes through that levels up all that I do. I have been able to fill every need, every single need with what I do with my hands. And it's not just because of my hands (they are my tools), I stay true to the purpose that I nourish my soul with, continually. Making money should never be the sole reason for starting any enterprising endeavor. It takes money to operate a business. It takes purpose to succeed in business, a business that should help others fill their needs. Do you sometimes have to pause to recall your purpose? If you can't answer that question, just let me know your thoughts in the comments. Oh yeah, check one of the boxes below, too.